The Satyam scam rocked the Rajya Sabha today with members alleging that the government was handling the fraud with ‘kid gloves’ and demanding a Joint Parliamentary Committee (JPC) probe into it. The government today introduced two bills concerning education in the Lok Sabha - one to grant statutory powers to the National Commission for Minority Educational Institutions and the other to set up 12 central universities in states having none to improve the low gross enrollment ratio of 11 per cent in higher education. Admitting that Naxal violence was posing a serious threat to the security of the country, the government today said such cases could be probed by the National Investigating Agency (NIA) if need arose. Leader of Opposition LK Advani today reiterated Gujarat Chief Minister Narendra Modi’s charge that the perpetrators of the Mumbai strikes must have had accomplices here in India. The Congress today said there was more to BJP leaders “irresponsible statements” regarding deeper investigations into “local support” for the 26/11 Mumbai terror attacks than what meets the eye. The Mumbai police today filed a chargesheet against 21 members of the Indian Mujahideen (IM) who were accused of bomb blasts in different parts of the country over the past three years. The accused include IT professionals, a doctor and a few persons with criminal record. The Prem Bhatia Memorial Trust will award scholarships to two Indian journalists for the categories of ‘best political writing’ and ‘best environmental issue reporting’ on May 8. The Mumbai police today said they had solved the kidnapping case of a teenager following the discovery of his body on Monday night. There is an unprecedented rush of aspirants seeking Congress tickets to contest from 14 Lok Sabha constituencies in Assam where the party is in power since 2001. Karnataka Chief Minister B S Yeddyurappa has said the high-speed rail links from Bangalore announced by Railway Minister Lalu Prasad Yadav in the Railway Budget will only benefit the people of Tamil Nadu and Kerala. The Rajya Sabha has passed a crucial bill to protect the uniqueness of India’s agricultural products, including the premium rice variety basmati exclusive to Himalayan foothills. The bill would also strengthen India’s geographical indications (GI) claim over the rice variety. Air Force officers today blew the lid off an inter-state racket vis-à-vis recruitment of airmen. IAF sources said suspicion was aroused after four candidates, who appeared for a written test conducted here yesterday and secured more than 90 per cent marks, could not even provide accurate responses to spellings of words during interviews today. Fearing rigging in the general polls, a delegation of Congress leaders from Punjab today met Union Home Minister P Chidambaram and Election Commission of India officials and sought deployment of paramilitary forces in the state. As many as 11pilgrims travelling to the Sabarimala hill shrine were killed and 40 others injured, 20 of them seriously, when their bus fell into a gorge near Erumeli town in Kottayam district in the wee hours today. The PMK, a constituent of the UPA government, has said ISI agents and Sri Lankan mercenaries had infiltrated into the state to disturb its peaceful atmosphere. A nine-member Afghanistan parliamentary delegation led by president of Afghanistan’s Wolesi Jirga (Lower House) Mohammad Younus Qanooni on Tuesday met Vice-President Hamid Ansari. Two CRPF personnel were killed and 23 others injured when their bus fell into a gorge in Senapati district of Manipur, official sources said today. Replying to supplementaries from members, Corporate Affairs Minister Prem Chand Gupta informed the House that the CBI had been instructed to probe the accounting fraud in Satyam Computer while the Serious Fraud Investigation Office (SFIO) had been given three months’ time to complete its investigations into it. The House of Elders devoted the entire Question Hour to the Satyam issue with Chairman M Hamid Ansari informing the House that there were several members who wanted to raise supplementaries on the main question, raised by Rajeev Chandra Sekhar. Maintaining that the country had a sound regulatory framework in place, the minister, however, noted that the Satyam fraud had shaken the confidence of not only the corporates but investors as well. However, the investigations were progressing satisfactorily and there was complete coordination among various agencies involved in the probe. The government was concerned about the well-being of 53000 employees of Satyam Computers and nearly 300,000 investors. “Let us not give a political colour to the scandal. The collapse of Satyam is not in the interest of the country and the reputation of the corporates. It is an unfortunate case but this is only an aberration,” Gupta said, while appealing to the agitated members not to politicise the scam. Some of the agitated members hit out at the government for the manner in which the investigations were being conducted. A Telugu Desam member alleged that the SFIO team was sitting “like ducks” in Hyderabad without conducting any investigations. Ram Jethmalani also felt that the investigations were not being conducted in a proper manner while Sharad Yadav of the Janata Dal (United) and some other wanted a JPC probe into the scandal. The minister evaded a direct reply to the demands for a JPC probe to go into all aspects of the scam, including allegations of political patronage to its disgraced founder B Ramalinga Raju. The National Commission for Minority Educational Institutions (Amendment) Bill, 2009 seeks to amend the 2004 Act, which requires the commission to consult state governments when according minority status to any educational institution. The amended bill deletes this provision, saying in certain cases the state government or its agency may be a party before the commission. If passed, this bill will grant overarching powers to the commission, which hears complaints of deprivation of rights of minorities to establish and administer educational institutions of their choice. The Central Universities Bill 2009 proposes to establish central varsities in Bihar, Gujarat, Haryana, Himachal Pradesh, Jammu and Kashmir, Jharkhand, Karnataka, Kerala, Orissa, Punjab, Rajasthan and Tamil Nadu and replaces the January 15 ordinance in this matter. Minister of state for higher education D Purandeshwari introduced the bill amidst severe criticism by the Left which questioned the government’s urgency of promulgating an ordinance when the House was seized of the matter. The CU Bill 2008 was introduced in Rajya Sabha on October 23 last and referred to the department related parliamentary committee, which submitted its report on December 17. “When the committee replied promptly, what was the government’s intent to promulgate an ordinance,” asked Left MP Varkala Radhakrishnan. The government blamed the haste on states, saying since the proposal had been pending for long and led to heightened expectations among the concerned states for action on the part of the government. “The government felt a number of preparatory steps were required for operationalising central varsities in time for the next academic session and incorporate amendments proposed by the parliamentary committee on HRD,” Purandeshwari explained. The 2009 Bill also proposes to convert three state universities in Chhattisgarh, Madhya Pradesh and Uttarakhand each into CUs. The bill incorporates seven of the 15 amendments proposed by the parliamentary committee. These include deletion of the clause vesting in the central government the power to give directions to the university, appointment of the first chancellor, vice-chancellor, registrar and finance officer by the visitor instead of the central government, provision for elected student representatives in the students' council and provision for at least two meetings of the students' council every academic year instead of one proposed in the bill. “Normally, these cases are not fit for investigation by the NIA. The agency can, however, take them up but a decision would then have to be taken on a case-to-case basis,” Home Minister P Chidambaram told the Lok Sabha during Question Hour today. He said the NIA would investigate only the gravest cases and those referred to it by the states. “So far, no such case has come to NIA,” he said, ruling out the agency’s role in Mumbai terror attack probe. “The Mumbai police is about to file a charge sheet in the case,” Chidambaram told the House, reiterating the government’s stand that the NIA would operate within the concurrent judicial framework, respecting the role of states in crime investigations. On the Naxal front, a whopping 851 attacks have already occurred in the past five months, leading to 253 civilian killings and 95 killings of security personnel in the nine affected states, the government informed Parliament. Half of these attacks -- 353 -- happened in Chhattisgarh alone, where the highest civilian casualty of 91 was reported and 47 security persons were killed. Jharkhand came a close second, with 263 Naxal attacks killing 83 civilians and 28 security men. Other Naxal-infested states include Andhra Pradesh (44 incidents; 17 killings); Bihar (80 attacks; 49 killings); Maharashtra (48 incidents; 16 killings); Orissa (44 attacks; 15 killings); West Bengal (12 attacks; 11 killings). Lowest Naxal violence in the infested states in the past five months was reported from Madhya Pradesh and Uttar Pradesh, where three and four attacks, respectively, occurred, killing one civilian. With barely any improvement to boast on this front, the government admitted that the number of Naxal incidents had remained the same over the past five years. “Naxals have not only indulged in wanton killings of civilians and guerilla attacks on security forces using land mines and explosives, they have also been targeting the socio-economic infrastructure and intimidating grassroots functionaries,” the government said. It proposes to set up 20 counter insurgency and anti-terrorism schools mainly in Naxal-infested areas. So far as the NIA goes, the Home Minister said its staff and infrastructure was in place to handle terror crimes. “As I speak, orders have been issued for appointment of one DIG, two SPs, two Deputy SPs and two inspectors,” Chidambaram said, adding that the government would take suo motu notice of rare cases of crimes. Speaking in the Lok Sabha on the motion of thanks to the presidential address, the BJP leader demanded that 26/11 should be investigated by India the same way as the US investigated its 9/11 terror attack. Advani, who apparently launched his election campaign from the Parliament by calling upon the people to reject the hand (referred to by stand-in Finance Minister Pranab Mukherjee’s Budget in his speech a day earlier) that allegedly caused price rise in the country. Congress leader V Kishore Chandra Deo who initiated the discussion earlier claimed that the UPA would go to people not merely with a bunch of promises, but with a basket full of achievements. Deo also hit out at the BJP saying it would not be able to seek votes in the name of terrorism. “You can’t seek votes on dead bodies,” Deo said, adding the Delhi election results had shown that “BJP’s terror agenda was a failure”. “Delhi’s mandate is like the mandate of all Indians. It is a microcosm,” Deo said, initiating the motion of thanks today. He revelled in the recent election victories, indicating the UPA would return to power. Interestingly, UPA chairperson Sonia Gandhi was present in the house for most part of the debate today. She was found thumping the desk throughout Deo’s reference to “terrorism not being a poll plank at all”. Congress’ Madhusudan Mistry seconded the motion. The Congress today said there was more to BJP leaders “irresponsible statements” regarding deeper investigations into “local support” for the 26/11 Mumbai terror attacks than what meets the eye. Gujarat Chief Minister Narendra Modi's statement on local support in the Mumbai terror attacks today found support in senior BJP leader LK Advani, who, while speaking in Lok Sabha, questioned the Mumbai police chief ruling out “local links” in Mumbai terror attacks. Congress spokesman Abhishek Manu Singhvi said “unsubstantiated” statements made by senior BJP leaders like Advani and Modi were, in fact, meant to divide the country and weaken its fight against terror. All of them have been arrested under the Maharashtra Control of Organised Crime Act (MCOCA). The chargesheet running into more than 1,800 pages was filed before Judge Y D Shinde of the special court set up under MCOCA. The names of the accused include Mohammed Mansoor Asghar Peerbhoy, alias Munna, a software engineer from Pune who had been employed with Yahoo. Peerbhoy has been accused of sending emails to various media houses warning of bomb blasts minutes before the explosive devices went off. Investigators say he had hacked into wi-fi connections belonging to various persons in order to send the emails. Apart from Peerbhoy, the other accused include Salman Kadar Shaikh, alias Mobin, and Asif Bashiruddin Shaikh. Both are also engineers, according to the prosecution. Fourth accused, Anwar Ali Bhagwan, iss a doctor by profession. The names of the others have been given as Dastagir Feroze Mujawar, alias Afrosh, a commerce graduate, Mohammed Ateek Mohammed Iqbal, a computer science graduate, Shafique Syed, Majeed Akhtar Shaikh and Yasir Syed, who owned mobile repair shops. The alleged bombers also include Syed Mohammed Naushad, a civil works contractor and Javed Mohammed Ali, an Islamic scholar. 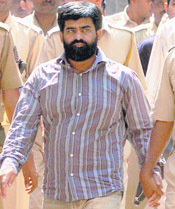 One accused Ahmed Bawa Abubakar is a farmer while another Farooq Sharifuddin Tarkash, alias Abdullah, is a computer science graduate. Faisal-e-Rehma Muskhan Durrani was a robber with a police record. The names of the other accused have been given as Mohammed Ali Ahmed, Mohammed Mutalib Usmani, Mohammed Sadik Israr Ahmed Shaikh, Mohammed Arif Badruddin Shaikh, Mohammed Zakir Abdul Shaikh, Ansar Ahmed Badshah Shaikh and Mohammed Akbar Ismail Choudhary. Ayesha Siddiqa, eminent Pakistani scholar and author will deliver the Prem Bhatia Memorial Lecture on “Building Bridges in Unknown Lands: War and Peace in South Asia” on the occasion. The trust offers the scholarship every year to journalists between the age of 25 and 40 for research in media-related subjects, which are topical and relevant to the Indian scene. Each of the scholarships is for Rs 75,000 for one year, sponsored by the Sir Dorabji Tata Trust. The amount is given in four instalments, the first being given on the day of conferment and the remaining would be given after each quarterly work in progress has been approved by the selection committee. In addition, at least two articles on the research topic should be published in journals or newspapers. The applicants should send a covering letter which includes an updated bio-data; a synopsis of the proposed subject of research and methodology; three clippings of recently-published articles; and a reference from the candidate’s editor, employer or, in the case of self-employed candidates, other suitable persons. According to the police, Mukim Khan (17), a Class XII student of Rizvi College in suburban Bandra, was kidnapped by two of his classmates, who wanted to extort a ransom of Rs 2 lakh from the victim’s father. Khan, whose parents are landowners in suburban Mumbai, was kidnapped after he left for the residence of his friend Amir Siddiqui Sheikh on Friday. The family received a ransom call from Mukim’s mobile phone later in the evening, the police said. However, based on the information from Mukim’s family, the police picked up Sheikh (19), and another friend Sarfaraz, who confessed to have murdered the teenager. According to Deputy Commissioner of Police Nisar Tamboli, the two had killed Mukim early on Friday and dumped his body near mangroves at Vakola. The two then made the ransom call to Mukim’s parents. However, after sustained interrogation, the two confessed to the murder and led investigators to the spot where the body of the youth was dumped. A hammer used to bludgeon the victim, ropes and a sack used to dispose of the body was also discovered from the site, Tamboli said. He threatened that the Karnataka government would withhold participation in the projects unless these were suitably modified. In a letter written to Lalu today, Yeddyurappa said Karnataka was the first state in the country to offer assistance to Indian Railway for high-speed rail link in the country. “However, our suggestion was to extend the high-speed rail link from Bangalore to Mumbai via Hubli with an additional link to Mysore. But, the Railways has proposed this service between Chennai-Bangalore and Bangalore-Ernakulam. Such projects will help only the people of Tamil Nadu and Kerala to come to Bangalore and will not help the people of Karnataka”. Yeddyurappa urged the Railway Minister to extend the proposed Chennai-Bangalore high-speed rail link to Mumbai via Hubli and introduce one more extension to between Mysore and Bangalore. “Otherwise, it may be difficult for Karnataka to support the project as envisaged by the Railways”, the Chief Minister said. He added that if the Railways considered his suggestions favourably, the Karnataka government would participate in the project. “Accordingly, I request you to modify the high-speed rail link projects while passing the Railway Budget 2009”, he wrote. Basmati, the aromatic long-grain rice variety, is cultivated only in Punjab, Haryana, Uttarakhand, parts of Jammu and Kashmir and western Uttar Pradesh in India. The adjoining Pakistan also grows the variety in its side of foothills. Earlier, India had been pursing a joint registration of basmati GI with Pakistan, but talks on the issue stand stalled following the 26/11 Mumbai terror attacks. Notably, registration under GI empowers a special product, produced in a particular place or region, to protect it against any infringement. Minister of State for Commerce Jairam Ramesh told the Upper House that the government was not sure if India could now have a joint registration of basmati under the GI with Pakistan. However, the Agricultural and Processed Food Products Export Development Authority (Apeda) (amendment) Bill 2008 would ensure that India’s interests over basmati were protected by claiming GI registry. In India, around 3.4 lakh farmers are involved in basmati cultivation and during the last fiscal alone around 1.5 to 1.6 MT, worth over Rs 7,500 crore, was exported. But, basmati name is being infringed upon and rice is being marketed under different names. “Despite so many years, we have not been able to protect the long-grain aromatic rice grown specifically in India. The name has been infringed upon and rice is being sold as texmati in the US,” he said. Ramesh said Basmati was important both for India and Pakistan as nowhere else in the world this variety of rice was grown. Vipin Kumar Wankhede, his brother Nitin, Naresh Rathore, all from MP’s Betul district, and Bhopal district-resident Amardeep Singh confessed during interrogation that they paid Rs 3 lakh each to Gwalior-resident coaching class instructor Suraj Singh Sikarwar, who has been arrested. Fake mark-sheets and other papers were seized. The Congress leaders, who were led by party’s Punjab in charge Mohsina Kidwai, alleged that the SAD-BJP combine would indulge in violence and booth capturing, as was done by them during the last panchayat and municipal polls. The delegation members, including former chief ministers Capt Amarinder Singh and Rajinder Kaur Bhattal, Union Ministers Ambika Soni and Ashwani Kumar, AICC spokesperson Manish Tewari and MPs Preneet Kaur, Rana Gurjeet Singh and Dharampal Sabharwal, also presented papers of what they called were “proof of atrocities” and “false FIRs” being registered against Congress workers. The Congress leaders demanded that central forces should be deployed across Punjab, and not in five districts that had been identified as “sensitive” by the state chief electoral officer. “The entire state is sensitive and needs to be dealt accordingly,” said Bhattal, as she emerged from the meeting. The bus, carrying 60 pilgrims from Andhra Pradesh's West Godavari district, slipped into a 50-foot gorge while it was passing the narrow Pampa Valley road. Founder leader of the party, S Ramadoss, on Saturday cautioned the state police and government that mercenaries and intelligence agents had been sent by the island government, and a Buddhist monastery having links with the Sri Lankan government, was providing shelter to them. ISI agents had been allocated a separate place with required comforts inside the monastery, he alleged. Sri Lankan Deputy High Commission office in Chennai was having more number of workers than permitted, Ramadoss charged and asked the authorities to keep a vigil on the activities of the monastery and the embassy office. Qanooni said Afghanistan was playing an instrumental role in strengthening the roots of democracy in the country. He also expressed gratitude towards India for the help in capacity building vis-à-vis Parliamentary practices and rules of procedure.